Later today starts another amazing 23 days of cycling. I have the Stevo locked on OLN and Newsgator pointed at Frank Steele’s always awesome Tour de France blog! Can Lance make it to seven? Will we see Jan Ullrich wear yellow in Paris? Can Ivan Basso stay with Lance again in the mountains? Is Bob Roll going to shave those gnarly muttonchops? I have no idea, but I cannot wait to find out! We’ll miss you this year Tyler Hamilton — Good luck! The start of Le Tour is just hours away and I am already on the edge with anticipation. No matter the outcome, I guarantee that it is going to be an epic battle. Far more dramatic and compelling than any over-hyped “reality show” could force feed viewers. Kudos to the Outdoor Live Network (OLN-TV) for their live unabridged coverage. I or my STeVo will be there from Liege to the Champs-ElysÃ©es in Paris! Also, for anyone even remotely interested in The Tour you simply must check out Frank Steele’s Tour de France Blog, which I believe is his third year blogging Le Tour. I’ve been subscribed to Frank’s feed for over a year and I feel like I’ve been kept up-to-date on the entire cycling season. Thanks Frank! Well, as I’m sure most know, Lance made it to number five. Congratulations also to the awesome Postal Team! I’ll add that this was certainly exemplified by, as Frank Steel puts it, Tyler “Freaking” Hamilton as well, who amazingly finished second in Saturday’s treacherous Time Trial, which moved him to fourth over all. Although, I must admit, I was on pins-and-needles last Saturday watching the Time Trial. As much as I wanted to see Lance pull-it-out, I felt awful watching Ulrich slide of a turn into the hay bails near the 10k mark. 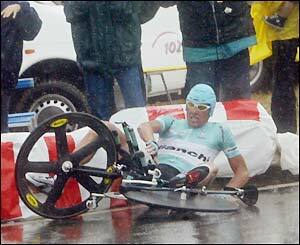 I didn’t want to see him go down nor Lance win based on a fall. I realize that’s part of the game and adds to the continuing drama, but it’s just sad to watch. I know I keep saying it, but what an awesome race! Kudos to all the riders in “Le Tour” this year!! I was on the edge of my seat, even while reading the live updates online of today’s stage 15. All I can say is WOW! I can’t wait to watch the replay tonight! “At the end of the 15th stage, Armstrong has increased his lead over Ullrich. The American is now 1’07” ahead of the German in the generall classification. Vinokourov began the day within 18″ of the overall lead, he finished it with a deficit of 2’45”. The final individual time-trial is going to be exciting as well. Over one minute is a lot of time for any rider to make up against Lance in a time-trial, but then again, Jan Ullrich is not just any rider! I’m still on the edge of my seat! BTW, Tyler Hamilton also finished up with the lead group today in 7th place, which puts him in 7th overall as well. Amazing! But, Tyler is still amazing in that he is fourth overall, 2:59 behind the Lance! It goes without saying, but the PyrÃ©nÃ©es are going to be tough! I do hope Tyler can continue in the Tour this year. IMHO, Tyler Hamilton is the unsung hero of the Tour this year. He should be getting more press for his acheivements! Yes, indeed go Lance! But I find myself amazing that not only is Tyler still in the Tour, he’s actually still riding with the leaders. Tyler, being one of them; in 5th place overall! Anil Dash points to a great Tour de France weblog. I’d like to add however, that VeloNews has been reporting live coverage of the tour in blog-like fashion for the last few years, which has been great as well! Go Postal! Pena in Yellow! Also, Tyler Hamilton, still riding with a broken collarbone, finishes the Team Time Trial with his CSC Tiscali team mates for a 10th place finish. Amazing! — Tyler Hamilton has started stage two of the Tour De France with a broken collarbone, which he suffered during yesterday’s massive crash at the end of stage one! After breaking my collarbone on a ride a few years ago, I could not even imagine sitting on my bike the day after let alone ride. I’m in awe. Go Tyler! This year being the 100 Anniversary of the Tour and (potentially) Armstrong’s 5th consecutive win, next only to Miguel Indurain, I’m eagerly awaiting the start of today’s prologue and live coverage on OLN TV. It also looks like VeloNews will again be blogging Live Tour Updates, which in past years has been extremely valuable given the time difference. today it seems like the trails are just screaming for me to come back!